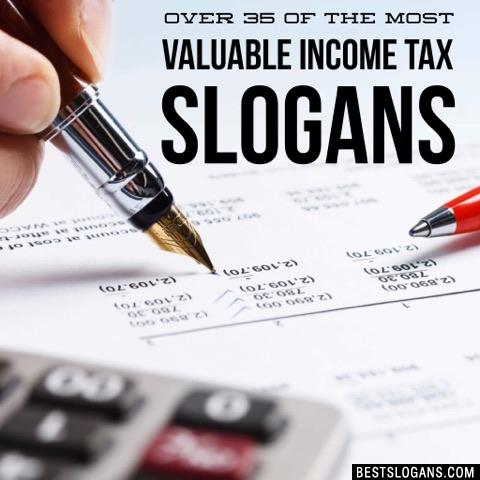 39 new entries added to income tax slogans, that include pictures. 1. Your Voice At The IRS. 1 Your Voice At The IRS. 2 Your Source For Trusted Personal Accounting And Tax Preparation. 3 Your Key To A Better Return. 4 Your Friendly Neighborhood Tax Office. 5 Your Final Stop For Tax Consulting. 7 Who Said Money Doesn't Grow On Trees? 8 We'll Take Care Of It For You. 9 We'll Get You What You Deserve. 10 Tax Service of The Future. 11 Tax Problems? We Can Help! 12 Relaxed And Experienced Tax Preparation. 13 Providing Quality Tax Services For Over 10 Years. 14 Protection, Peace of Mind & Accuracy. 15 Preparing Americas Taxes Since 1955. 16 Planning For The Future. 17 More For Your Taxes. 19 Looking After Your Books So You Dont Have To. 20 Keeping An Eye On The Bottom Line. Can you think of a good Income Tax Slogans we're missing? Or come up with a clever one of your own. Please share below.